A comedian? Lucas Oil Raceway? In February? To raise money for a local domestic abuse shelter? Yes, these four things don&apos;t seem to have much in common, but they will all converge on Feb. 10 when national comedian Michael Jr. performs live during the 2018 Premier Event, Sheltering Wings&apos; major annual fund-raiser. 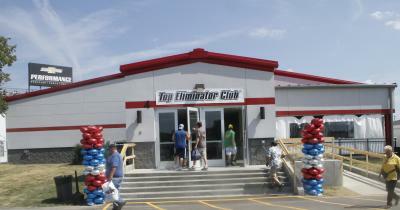 Building off the theme, Live, Laugh, Love, organizers from Sheltering Wings decided a popular comedian could entice both locals and visitors to the Top Eliminator Club Pavilion inside Lucas Oil Raceway in Brownsburg. If you&apos;ve not seen Michael Jr. or even know who he is, you are missing out because he is funny. His television appearances include The Tonight Show, The Late, Late Show, Oprah, Jimmy Kimmel Live, The Bob and Tom Show, Bryon Allen’s Comic Unleashed and more. He also routinely performs at the most prestigious comedy clubs across the nation while touring. Cost for the live event is $100 a person, which includes cover admission to see Michael Jr. live and dinner, and every dollar raised goes directly to Sheltering Wings. The domestic abuse shelter has served as a safe haven for more than 1,600 women and 1,800 children in its 16-year existence and handled more than 16,000 crisis calls and educated more than 200,000 people in the community about domestic violence. The semi-formal event also will have a number of auctions throughout the night to raise more money. This will mark the second consecutive year that the TEC Pavilion at Lucas Oil Raceway has hosted the event. The track built the facility in 2016 for its Top Eliminator Club members during the annual Chevrolet Performance U.S. Nationals event, but track officials planned all along to utilize the facility for other events throughout the year. Autumn Bucy, annual fund coordinator at Sheltering Wings, said last year&apos;s Premier Event was the first off-site event to be held there. "It is a beautiful facility and works perfectly for our needs," she said. Eric Flatt, the new Marketing and Partnership Manager for Lucas Oil Raceway, said the building is finally ready to host more groups and events. Boasting 1,600 square feet of space, the facility includes and open floor plan that can accomodate up to 900 people with restrooms, an outdoor patio, a bar area and a large garage door for easy setup and tear down. Tours are available for event organizers wanting to see the building. Bucy said Sheltering Wings&apos; Premier Event attracted about 400 visitors last year, and with a national comedian as their headliner this year, she expects that number to grow. Tickets still remain and can be purchased on the Sheltering Wings website.